The main difference between the type 1 and type 2 diabetes mellitus is that type 1 diabetes mellitus has a complete deficiency of required amount of insulin and type 2 diabetes mellitus is caused by insulin resistance (insulin deficiency can also occur in varying amount, but is not the primary cause). Type 1 diabetes is an autoimmune disease that leads to a destruction of the beta cells of the pancreas. In type 1 diabetes mellitus insulin is given as replacement therapy while in the case of type 2 diabetes insulin is given for the control of hyperglycemia and the insulin is added when initial treatment with non-pharmacological like exercise, diet control, weight reduction and oral medication like metformin are not able to control the glucose level. In the past, insulin was extracted from animals for the use of the treatment in humans. This resulted in the development of antibodies against the injected insulin in some of the patients, leading to complications. This was resolved by the introduction of biosynthetic human insulin, which is manufactured by using the recombinant DNA technology. There are two categories of recombinant insulin. One is the rapid-acting insulin, which is intended to be used after a meal. It has an effect around the 15 minutes after giving the injection. The second is long-acting insulin which has an effect lasting for around 24 hours (basal insulin). A combination of the two is usually used for the treatment of diabetes. Insulin is administered subcutaneously or parenterally (it is destroyed by gastric acid). Long- or intermediate-acting insulin constitutes the basal insulin and it is normally given as one to two injections per day. The short- or rapidly-acting insulin constitutes the prandial insulin and is given three or more times a day. Insulin facilitates glucose intake into the cell by increasing potassium intake (a mechanism which is an asset for the treatment of hyperkalemia). The main mechanism of degradation of insulin is receptor-mediated endocytosis followed by degradation by insulin degrading enzymes. 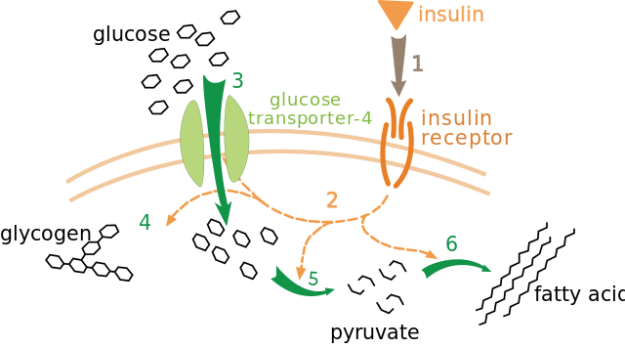 Insulin also decreases the glucose level by increasing the synthesis of glycogen (the storage form of glucose), decreasing the formation of new glucose (gluconeogenesis), and channeling the glucose into lipid synthesis pathway. Insulin is given as a replacement therapy for the patients. Metformin is the first drug for the treatment of type 2 diabetes. If metformin only therapy is not effective, another oral anti-diabetic drug or insulin can be added. Insulin is preferred in patients with glycated hemoglobin greater than 9.5%, persistent random glucose level greater than 300 mg/dl, presence of ketones in urine and fasting blood glucose greater than 215 mg/dl. In case of gestational diabetes mellitus, insulin is not the preferred therapy but if it is needed, Insulin detemir is the one usually used. The aim in the treatment of patients with type 1 diabetes mellitus is to maintain the glycated hemoglobin level (HbA1c) at a value of 7% or lower. The insulin therapy is to provide a complete physiological alternative (replacement therapy). Treatment consists of administration of basal insulin (long-acting or intermediate insulin or continuous administration of subcutaneous insulin) 1 to 2 times a day and regular or short-acting insulin pre-meal. The amount of the pre-meal bolus is to be determined by a number of factors such as the quality and composition of the food to be taken in the meal, the amount of activity expected after taking the food, and the glucose level before the meal. Hypoglycemia can occur frequently, so stringent glucose monitoring is required – at least 6 times a day (self-monitoring of blood glucose (SMBG). In addition to this, education, proper nutrition, and activity (30 minutes of aerobic activity) form an important aspect of the management. It is required to modify the insulin administration based on the exercise undertaken. As the name describes, the insulin is administered in a continuous manner and only the short or regular insulin is used. But the disadvantage is that it is not economical and there is a sudden chance for complication due to machine malfunction. The choice between the continuous and the injection treatment is mainly based on the patient preference. The efficacy and the hypoglycemic episodes are the same with both the regimens. In one of the trial, it was demonstrated that when a patient was given the choice of both, more than half chose continuous subcutaneous therapy. 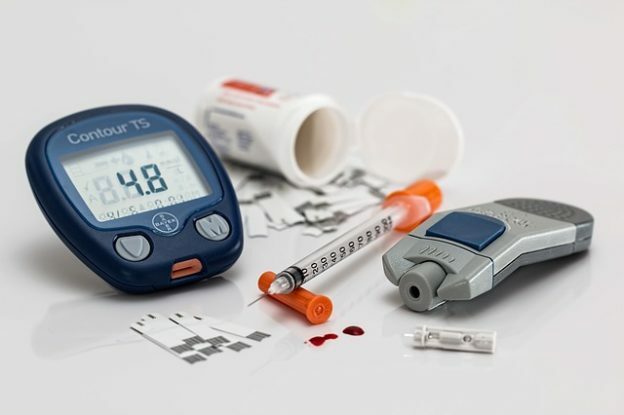 The factors like the variability in the intra-day insulin requirement and the inherent antagonising hormones in the body need to be taken care of when giving the insulin through the pump. For those patients who are not responding to oral hypoglycemic drugs, insulin can be added as a therapy. Metformin is the drug which is commonly used in combination with insulin. When the patients are first started on insulin, it is commonly recommended to start on basal insulin, rather than prandial insulin. The idea is that the occurrence of hypoglycemic episodes is relatively less with the basal insulin. Weight gain and hypoglycemic attack are concerns with the use of insulin in the treatment of type 2 diabetes. Insulin also has the risk of causing hypokalemia and causing lipodystrophy at the injection site. Another rare side effect is the risk of immunogenicity (allergic anaphylactic reaction). Very rarely, insulin can be used for the diagnosis of pituitary function problems. Insulin tolerance tests can be used to assess the integrity of the hypothalamic pituitary adrenal axis. Poomalar GK. Changing trends in management of gestational diabetes mellitus. Vol. 6, World Journal of Diabetes. 2015. p. 284–95. The effect of intensive treatment of diabetes on the development and progression of long-term complications in insulin-dependent diabetes mellitus. The Diabetes Control and Complications Trial Research Group. N Engl J Med. 1993 Sep;329(14):977–86. Effect of intensive therapy on residual beta-cell function in patients with type 1 diabetes in the diabetes control and complications trial. A randomized, controlled trial. The Diabetes Control and Complications Trial Research Group. Ann Intern Med. 1998 Apr;128(7):517–23. Misso ML, Egberts KJ, Page M, O’Connor D, Shaw J. 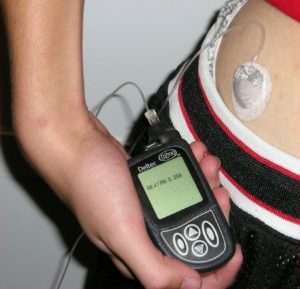 Continuous subcutaneous insulin infusion (CSII) versus multiple insulin injections for type 1 diabetes mellitus. Cochrane database Syst Rev. 2010;(1):CD005103. Fatourechi MM, Kudva YC, Murad MH, Elamin MB, Tabini CC, Montori VM. Clinical review: Hypoglycemia with intensive insulin therapy: a systematic review and meta-analyses of randomized trials of continuous subcutaneous insulin infusion versus multiple daily injections. J Clin Endocrinol Metab. 2009 Mar;94(3):729–40. Colquitt J, Royle P, Waugh N. Are analogue insulins better than soluble in continuous subcutaneous insulin infusion? Results of a meta-analysis. Diabet Med. 2003 Oct;20(10):863–6. Intensive blood-glucose control with sulphonylureas or insulin compared with conventional treatment and risk of complications in patients with type 2 diabetes (UKPDS 33). UK Prospective Diabetes Study (UKPDS) Group. Lancet (London, England). 1998 Sep;352(9131):837–53.